Part of the never-ending chapters of Melaka 2013 … Okay okay, 2nd last chapter already. Bear with me. When you’re in Melaka, you can really eat until you drop. Literally falling flat on your face. The combination of mains, signature dishes, places of interest, snacking opportunities and specialty outlets will render your food trail very VERY fruitful. Especially if you love to eat (wait, if you’re reading this now, I guess it goes without saying? ), and willing to pack in hours after hours of devouring sinfully good food. The food options slowly turn to a bottleneck after sundown though, as most food stalls are closed by then; with only the extremely commercialized (and lifeless, in spite of the camaraderie) Jonker Walk for your fix of typical ‘pasar malam’ fares. 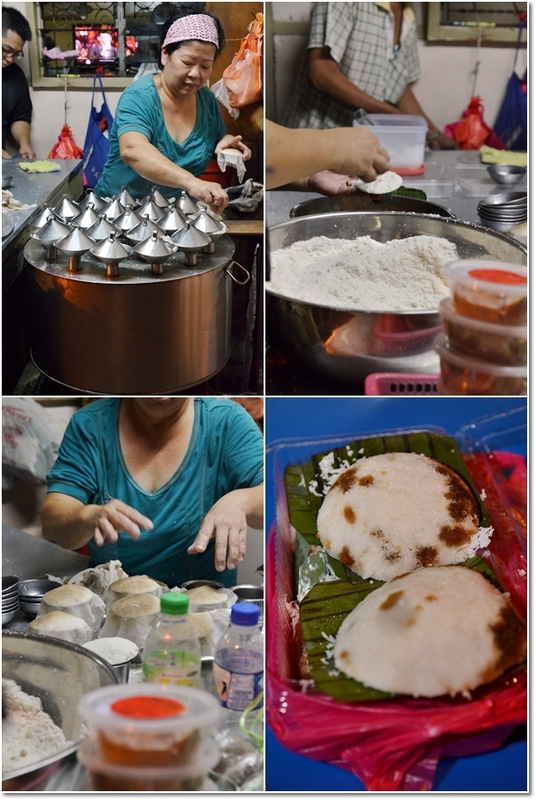 It’s always engaging to see how they churn out hundreds, or probably thousands of this pale-coloured, dotted with patches of dark brown snack named Putu Piring. Don’t worry. You don’t have to settle for Hard Rock Cafe, Starbucks or more chicken rice balls post-dinner. Drive a short distance away from town along Jalan Tengkera, and you should be on the lookout to your LEFT (if you’re coming from Melaka town’s direction) for this only brightly-lit stall. 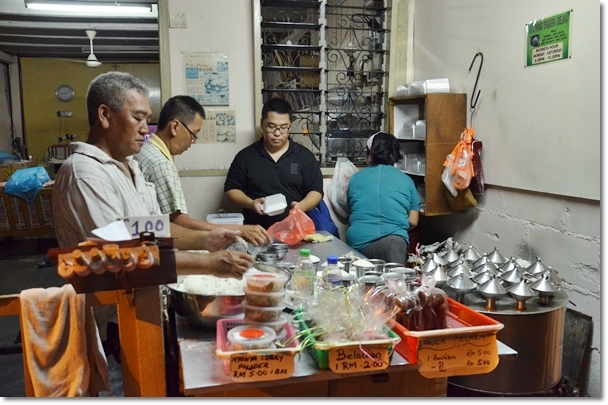 If Jalan Tengkera somehow sounds familiar, remember this post on Baba Charlie’s Nyonya Kuih? It’s around the same area, along the same road. Putu Piring Tengkera is nearer to Melaka town, while Baba Charlie’s further west towards Klebang’s direction. But beware as you can easily zoom past this stall since they only open from 6pm onwards until 10pm daily except Sundays. The road is generally devoid of life (or business), so don’t speed and miss this. I suggest for you to come much earlier than 10pm though, as on better days, they can run out of putu piring to sell. How’s the taste like, and is this worthy of the journey amidst the darkness, and the RM1 (USD0.30) per piece of flour? I would say YES, especially if you have the hots for putu foodstuff (putu mayam/string hoppers, etc). As the putu piring are steamed on the spot, you’ll gain the satisfaction of biting into a warm piece of palm-sized rice flour confection on a square base of banana leaf, studded with delicious bits of gula melaka (palm sugar syrup); and atop a bed of shredded coconut. Eat this while it’s hot. RM1.00 for a regular piece, RM1.20 for additional sugar (gula melaka) or RM1.10 for additional coconut. In any case, if you’re not fond of the wait and trip to Klebang for the famed coconut shake, then by all means get your cravings settled here at Batu Berendam. 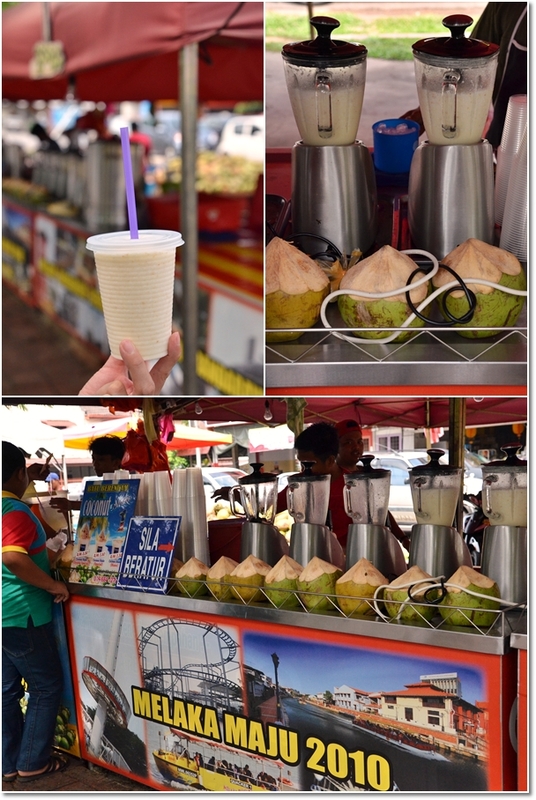 And so, on the next day right before we left for Kuala Lumpur, and after the chicken rice balls brunch at Huang Chang, we bought a refreshing, icy cold cup of Batu Berendam Coconut Shake from this roadside stall along the main road of Batu Berendam. I have actually missed tagging the spot, hence I need help here guys. 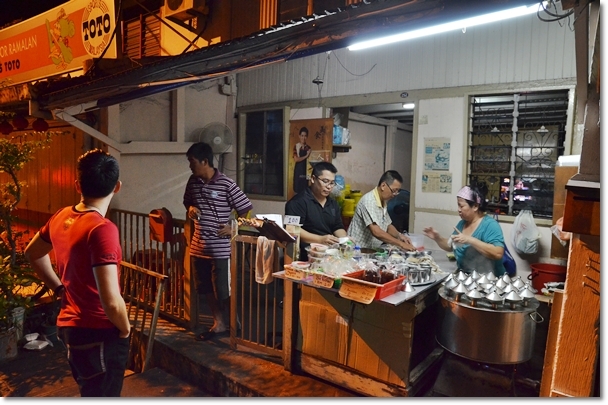 Anyway, this stall is very apparent from the main road of Jalan Batu Berendam, and opens in the daytime as well. Comparing this to Klebang Coconut Shake? I still prefer the latter. They raised the price for the putu piring again? 2 years ago it was 80sen, then 90 sen and now RM1?